The unwillingness of the US to declassify the infamous 28-page report related to the 9/11 attacks as well as Saudi Arabia's panic over the possibility to be held responsible for the tragedy prompt justified suspicions. The US Senate bill S.2040 entitled 'Justice Against Sponsors of Terrorism Act' was introduced on September 16, 2015. If passed by the Congress, the legislation would deprive Saudi Arabia royals of the so-called "sovereign immunity" in the 9/11 case and make public the 28-page joint congressional inquiry. In response, the Saudis claimed that they would sell an estimated $750 billion in assets under the pretext that Washington may freeze them if the legislation became law. The move would have dealt a significant blow to the US economy. However, President Obama and US lawmakers have unanimously decided that some unpleasant truths hidden in the report should remain shrouded in secrecy and the bill should not come into force. Riyadh's Blackmail: Is Washington Afraid of Saudi Threats to Dump Dollar? Commenting on President Obama's unwillingness to declassify the inquiry, Christopher A. Preble, vice president for defense and foreign policy studies at the Cato Institute, recalls that the Bush administration had already redacted the report. "The Bush administration redacted the pages before release — allegedly 'for reasons of national security' — and its successor has so far concurred with this decision," he writes in his article for The National Interest. He points to the fact that former Florida Senator Bob Graham and former Congressman and CIA veteran Porter Goss have repeatedly called for the document to be released for the public. "We can therefore speculate that the blacked-out pages are not concealing sensitive sources and methods, otherwise Goss wouldn't favor their release," Preble believes. According to the US scholar there is a broader problem: namely, Washington's complicity with undemocratic and brutal leaders that would be revealed in the spotlight by the 28-page report. "There is a rather long-running tradition of US presidents engaging in subterfuge, misdirection and/or outright deception about such matters. And some of these associations with undemocratic, shady and/or brutal leaders might have been justifiable under the circumstances," Preble stresses. Emma Ashford of the Cato Institute echoes Preble's stance: according to Ashford, the document hardly contains any explosive information; furthermore some of the purported revelations are, in fact, already known to the public. She refers to the fact that "it has been long known that Saudi Arabia has had a hand in the spread, through schools and philanthropic endeavors, of a certain kind of extremist Islamic philosophy often described as Wahhabism." Ashford also notes that it is no longer a secret that many Saudi private donors have been sponsoring radical Sunni Islamists for decades. "I think that it's complicated in the sense that, it's not that it was Saudi government policy to support al-Qaeda, but there were a number of very wealthy individuals in Saudi Arabia who would contribute, sometimes directly, to extremist groups. Sometimes to charities that were kind of, ended up being ways to launder money to these groups," Rhodes notes nailing Riyadh for 'insufficient attention' to extremist funding. In this context the 28-page document may shed some light on the extent to which the Saudi government turned a blind eye to terrorist funding, Ashford remarks. And still the exposure is unlikely to become a sort of information bomb. However, it is unlikely that the infamous report would prove Riyadh's complicity in a court of law, Preble and Ashford note, pointing to the fact that the inquiry found "no evidence that the Saudi government as an institution or senior Saudi officials individually funded the organization" that carried out the deadly 9/11 attacks. It seems that the truth of the matter is that the US-Saudi relationship has long been deteriorating and Washington does not want to hammer the final nail in its coffin by declassifying the report. However, Preble believes that by sweeping the case under the rug the White House is only making the matters worse. 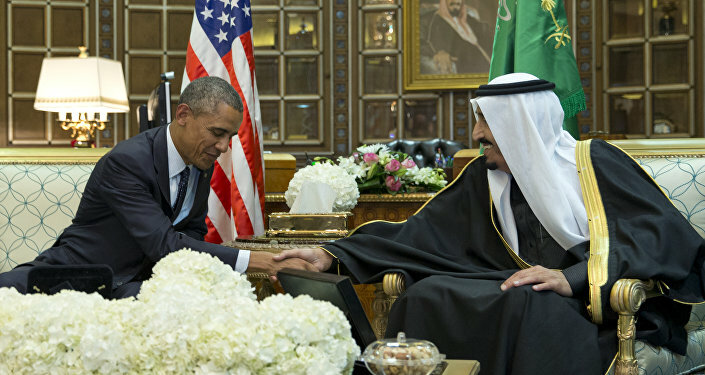 "The case for concealing the nature of the US-Saudi relationship was never very strong. Nor is the case for blacking out those twenty-eight pages. Some secrets need protecting, but this is one story that needs to be told," he concludes. Marriage of Convenience: Does Washington Really Need Saudi Arabia as Ally?